There was a time that letter-writing was considered an art, something that nearly every woman and many men engaged in on a regular basis. In our fast-paced world, however, it seems to have fallen by the wayside. As I've said before, I am truly thankful for the internet and email, and the convenience it brings. However, a real, handwritten letter is still one of my favorite things to receive. Everyone I know is excited when they receive something in their mailbox, whether it be a letter from their little sibling or a slip for a package from their mother. I know that the the elation I receive when I open my mailbox and find something in it is wonderful. It's rather sad when it's completely empty, even though I certainly don't expect to find something every day! When the letters or packages do come, they truly brighten my day and make me feel special. I've begun to actually look forward to Mondays, because there are usually letters waiting for me in the afternoon, ones that piled up over the weekend when the campus post office isn't open. I received 4 letters this past Monday - what a blessing! Yes, everyone I know, whether male or female, appreciates receiving letters. And I've found the secret to receiving a lot of mail is to write a lot of letters! Now, of course, this shouldn't be our only motivation for writing to people, and we shouldn't always expect them to write back, but they often do. After all, when you receive a letter from a friend or family member full of questions and news, you often feel compelled to write back and share your own news, answering the questions. Through email and now our family-plan cell phones, it's easier to quickly send an email or call up someone if you need something. And for small requests or things you need immediately, it's the best plan. And though I'm starting to enjoy long phone conversations (I used to greatly dislike talking on the phone), I still enjoy written conversations, that you can keep and read again and again. Also, as part of my personality, I express myself better through writing, so long letters serve the purpose for me quite well! I am blessed to have friends and family that keep me well-supplied with mail on a regular basis, and I in turn try to keep them excitedly checking their mailboxes. While away at college, letters have become an even more special touch of home or friendships. I've continued writing Lydia and Elijah, as we send letters from one college to another. I also try to write Mom, Dad, and Jubilee at home every once-and-a-while, though I keep up-to-date through the phone most often. Us "sisters of the heart" keep the letters flying between us, and it is always such a joy to find a letter from Miriam, Gabrielle, or Jennifer. My penpal of 6 years, Anna, and I still keep in touch, as we're both freshmen at college this year. It's amazing to see where the years have brought us as we've written back and forth. Natalie and I have begun exchanging letters as well, and it's been a great way to keep in touch with a dear family I've done so much with. Then there are surprise letters, from other family members, former dance students, or families I've babysat, and each one is always so much fun to receive. I don't have as much time for writing letters as I used to, and sometimes have to put off my replies longer than I would care to, but I manage to find time here and there to write pretty regularly. My pen isn't still for long. =) I often carry around stationery and the recent letters I've received with me in my backpack, so that I can answer them in the spare moments I have throughout the day. The weekend also is a great time to catch up on correspondence, and, when the weather is nice, sitting outside is a beautiful atmosphere inspires long musings. Letter writing does take time, but it is time well worth it! Another thing I've made my "mission" is to remember the birthday of each member of my family, and each close friend or whole families I count as "second families" back home. I have fun making a personal birthday card or buying a card in the bookstore, putting together a package on some occasions, and try to mail it to them as close to the day of their birthday as possible. It's a way of letting them know that I remember them, and that I care. Letter-writing truly is an art. You find pretty paper from your stash based on your mood or the person you're writing, or even make your own. You choose a pen that writes well, sometimes corresponding the color of the ink to match the stationery. You cover it with flowing script, trying to make even lines, and yet not demanding that it be perfect, as long as it's easily legible! You write about your day, share exciting news, and ask questions of and encourage the one you're writing to. You sign your name, and perhaps add an applicable Scripture verse at the end. You address the envelope, lick it shut, and maybe even brighten up the envelope with a sticker or two. On goes the stamp, and you drop it in the mailbox, praying that it will brighten the day of the one you send it to. I must admit, I have a weakness for stationery, and buy quite a bit of it! It's getting harder to find these days, so when I do find some nice packets for a great price, I often stock up on it. It's hard to resist! However, it all gets used eventually, and I enjoy having a big selection to choose from. I found a pretty, large box over the summer to store it in, which keeps it fairly organized and easy to find! Letter writing doesn't have to be a consistent thing, for I know that everyone is quite busy. However, it is a fun and rewarding thing to find time for. Even if it's just a quick note that you drop in the mail, your recipient will be glad to receive it. And though faithful penpals are tons of fun, just because you write to someone doesn't mean that you are required to do it regularly! Sometimes the sporadic once-in-a-while letters are the best surprise. 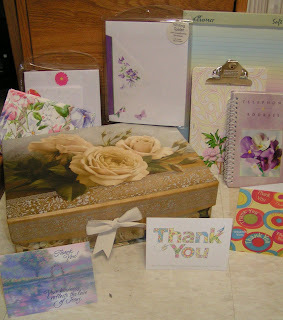 Thank-you cards are also a great thing to send through the mail. They don't take much time to write, but they allow you to express gratefulness from your heart in a personal way. Not everyone will find as much joy in writing letters, which I completely understand. It is something to consider doing more often, however. So, who have you written recently? Did you know that I have your letter on the table, waiting to be responded to, right now? It is going to get done soon! I love writing to you. Letters in the mail are such a joy. As we say all the time, they brighten up the bills. Packages are fun surprises too. I love letter-writing, and am so sorry that it's fallen out of fashion. I have several correspondents, but the bulk of my letters are addressed to my oldest brother, who is at college. I like writing letters! I have one penpal, we wrote to each other often last year. This year we talk almost every night online, and send text messages throughout the week, and recently talk on the phone, so our letter's to each other aren't as often as it was. Sometimes I write one of my Aunt's in Florida, and occassionally my former piano teacher, but since she'd rather talk on the phone than write I try to call her several times throughout the year. Writing letters is a lot of fun! I to like finding pretty stationary and I love stickers! I wouldn't mind writing people more often! I try to remember birthday's too, that's always fun! Great post! I have a couple pen pals that I enjoy writing to, and just recently we've started writing to a friends of ours who's at college. She's lonely, and she's been having a hard time, so we're trying to cheer her up. That's why I thought it was neat to see a post from you about getting letters at college. I'm glad you have lots of friends and family to keep in touch with! I know exactly what you mean!!!!! I have a lot of pen-pals.....Actually, Miriam is one of them).... and they are sooooooo much fun to write to!!!!!!!!!!!! I really love writing letters too! A ministry opportunity that one of my Sunday school classmates has started is writing to elderly people in our church. It has proved to be a blessing to me, as well as to the people I write to. When I began participating, I never expected to receive a letter back, as we write to a different person each week, and I therefore thought that we wouldn't really form a "friendship" with any one person. Well, last week I received a note back from a dear elderly lady who expressed her thanks to me for sending the note. She said it truly made her day to receive it, and she even included her phone number so that I could call her sometime for a "visit." I would like to strongly encourage everyone (if you don't already) to "adopt" an elderly person(s) and to send notes of encouragement - including Bible verses in the note is nice too. :) It is such a simple way to add a piece of sunshine to someone's day. I love writing letters, too. Besides enjoying writing to all my friends, it also helps to relieve tension or stress (at least, for me!). I write to Anna, Jen, Ella, Gini, and occasionally my great-aunt in North Carolina. Those are my steady pen-pals. I agree with everyone else, receiving those letters in the mail is lots of fun! I love letters! I stil have several pen-pals though when I was in high school I had up to 10-15 at one time!!! That was hard to keep up with sometimes. I now only have just a handful of people I write to on a regular basis. One being my great-aunt in Australia, another a young lady I met while in high school and have continued to keep in touch with (so much so that she came all the way from Florida for my wedding!). I also have a couple pen-pals that are much younger than I and live just down the street! But it is still fun to receive letters from them. Since it is a rainy day today maybe I'll write some letters... I am a little behind! Thanks for the post Anna! Last week, I wrote a letter to each of my grandparents; they're all divorced and remarried, so I had a lot to write to! I'm trying to get some of my friends to give me their addresses so I can write to them, but so far they've been resistant, for some reason ... I think it's because they don't even know their address! And thank you for the birthday card, you have a special way with words and encouragement.